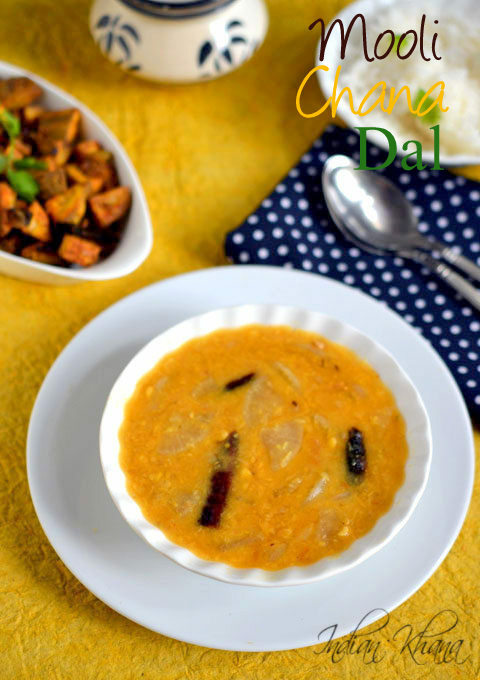 If you don't like to eat radish raw then making dal is very good option to include radish in diet or when you look for quick lunch or dinner option then this dal comes very handy just serve along papad, achar if you don't want to make any side dish or don't have time for it. I made Aratikaya Vepudu (plantain stirfry) along on a weekend for easy, quick and simple lunch menu. 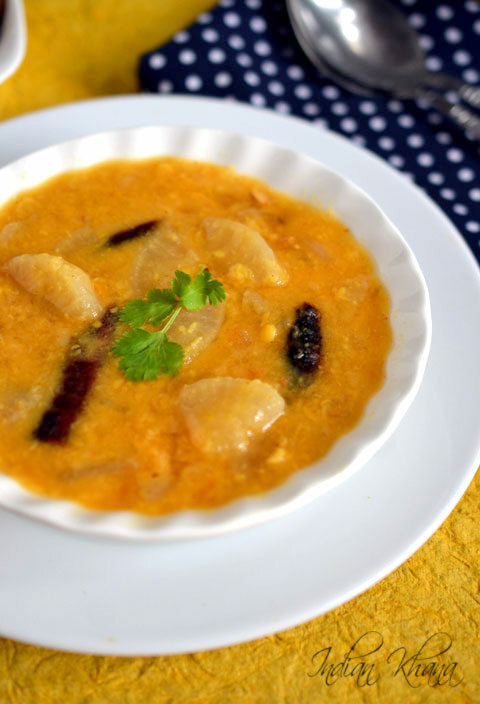 Easy, healthy mooli chana dal is vegan dal recipe for great comfort food. 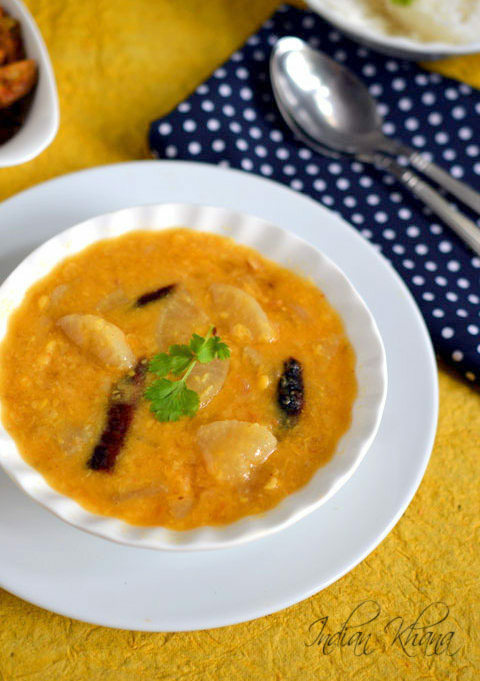 Wash and soak chana dal for 10 minutes (or more time) and meanwhile wash, peel and chop radish. 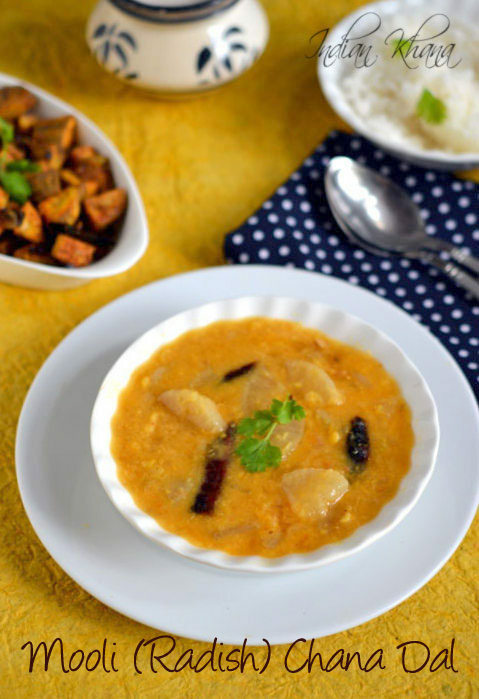 Pressure cook chana dal, radish (mooli), turmeric powder and 2-2.5 cups water for 4-5 whistles. Once pressure released slight mash the dal. Peel and chop onion. In a wok or pan heat oil add hing, garlic and saute until garlic becomes golden brown, add cumin seeds, dry red chili and saute until cumin splutters, add onion and saute. Saute onion until golden brown, add red chili powder, coriander powder mix and saute for a min in low flame. Add cooked dal with radish, salt (water more if needed, I didn't add any more water) mix well and bring dal to good boil. Simmer for 5 minutes in medium flame and off gas.